Your Southern Oregon adventure starts here! The ski may have been invented on the Russian steppes(something that we think were skis were found by archeologists dating back over 5000years), but the Scandinavians certainly perfected it. Almost every stage of development of the ski we owe to the heath stompers of the untrammeled North. 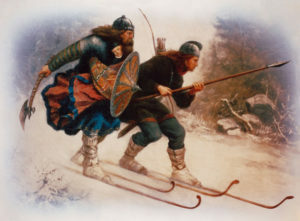 Thousands of years ago, the indigenous Sami people of northern Scandinavia used to go about on asymmetrical skis. One ski would be very long (3-4m), and was used for gliding and the other, shorter ski would be for traction and was used to kick along. The shorter ski would have seal skin fastened to the underside. Smooth one direction, and grippy the other. 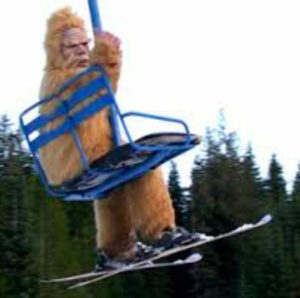 Modern skiers still use ‘skins’ to climb, but theirs are made of mohair. Our forbears used a single long pole with both hands for control and for a break when going down hill. We believe that these skis were originally developed to hunt seals on precarious pack ice on the northern seas. Although accounts of people using two poles dates back to the early 18th century, the single pole method survived all the way up through the 19th century. 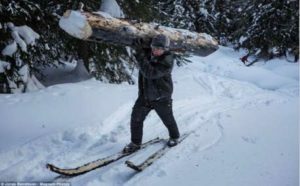 Skis originally were a pragmatists tool, they were generally used to cover ground when hunting, and later for martial purposes. Early skiers would ‘run down’ their prey by skiing down hill with spears. The ski huntsmen would deftly descend upon their game while it was hampered by the deep snow. Bindings with a heel strap have been used for thousands of years. They were likely invented in the Telemark province of Norway, to which this style of skiing owes its name. First, a leather strap stabilized the heel and this eventually converted toa wire. This gave skiers the ability to maneuver in much steeper terrain, since they could turn the skis edge into the slope. Telemark skiing has seen a revival since the 1970s because the bindings and boots have improved by leaps and bounds. A telemarker can now take every bit as steep a slope as an alpine skier. To some though, the telemark skier is still viewed as the Neanderthal on skis. Most alpine skiers prefer to have the heel of their boots locked down for optimum control. Its true that this may provide a greater stability when skiing down hill all day, but what if you need to climb? Have you ever seen someone try to climb even a meager slope on alpine skis? How about on flat ground? Fish out of water. I’m personally fond of the finesse of the telemark technique. Skiing for me, as it was for the ancients, is a way cover long distances over varying terrain. Over hill and dale, as they say. Backcountry skiing is the perfect synthesis of these two principals. The backcountry skier needs no chair lift, no expensive resort pass. The back country skier strikes out in whatever direction suits him/her. Free your heel, free your mind. 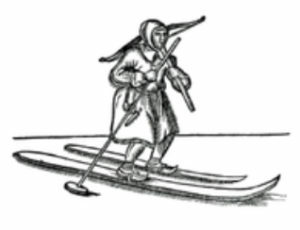 Backcountry skiing is certainly the oldest form of skiing, but the equipment has changed considerably in the last thousand years. It has become much lighter, and more durable. But three developments in particular have provided major refinements: the textured waist, camber and sidecut. The textured waist is the fishscale pattern underfoot which provides traction when the skiers weight is applied. Before this, waxes and rosins had to be applied, but these performed poorly when the snow conditions were not optimal. higher than the tip(or shovel) and the tail. The smooth tip and tail glide freely as the skier kicks forward with the traction pattern underfoot. 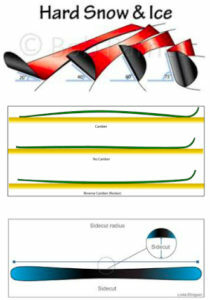 Sidecut is the parabolic shape that makes the tip and tail wider than the waist. They not only float better in deep snow, they also turn better because the whole ski flexes when carving. In the spirit of the Birkebeiners, a ski contest which bears that name is still well attended in many parts of the world. In Norway, and in Wisconsin and Minnesota, people flock in winter to race each other carrying a small, baby sized bundle, a ‘stand in’ for the infant Hakkon. That was his nickname. In 1850s California, what were called by local rubes ‘snowshoes’ were actually 12’ long homemade wooden skis. 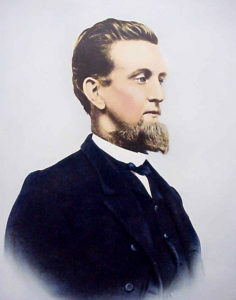 John Albert Thompson was born in Norway in the early 19th century, and like so many of his poor countrymen, had to emigrate to greener pastures. There were plenty of green pastures in Wisconsin, and Scandinavians flocked there during this challenging period. When he was 23 he drove a herd of milk cows out west and settled in Putah Creek, in the Sacramento valley. Thompson delivered mail between Placerville, California and Virginia City, Nevada. He used to regularly cover the 150 miles of extreme alpine terrain. He achieved this on his extra long skis and a single sturdy wooden pole generally held in both hands. He knew this version of backcountry skiing from his native Norway, and employed it during the winter as one of the earliest pioneers of the skill in America. He was never lost in blizzards. He is even credited with rescuing a man with frostbite after having been snowed into his cabin. 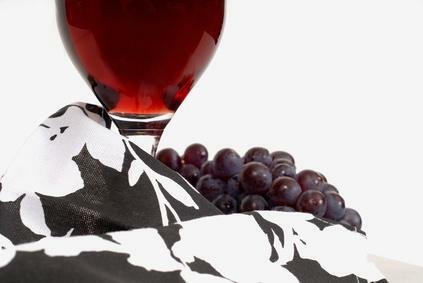 Thompson realized that the mans frostbite would be lethal, so he skied over the mountains and brought back chlorophyl which ultimately saved the mans life. Despite twenty years of service, and even a trip to Washington DC to appeal, Thompson was never paid for carrying the mail. 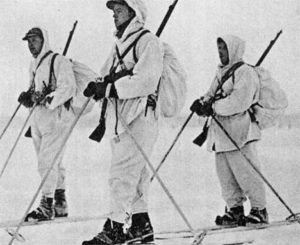 Very many troops took to skis in the occupied North after the Nazis took over. Among them saboteurs. In the late part of the war a certain Claus Helberg was on a mission to sabotage a facility in the high mountains where the Germans were making ‘heavy water’, an ingredient which could have helped them develop an atomic bomb. In the daring ‘Operation Swallow’, several Norwegian resistance fighters made for the facility on skis, under the cover of night, to try to dismantle it and also carry off some intel if they could. One of these was Claus Helberg, who was discovered at the last minute perhaps snipping wires or spray painting ‘Claus was here’ on the fusion silo. He was pursued doggedly on skis by a Nazi officer, exchanging shots all the while. Claus managed to wound the officer and get away. But the chase lasted all day and when night had fallen Claus skied off a cliff and broke his arm. After skiing all busted up the entire next day he finally approached a German encampment and told them he had been working for them: hunting down saboteurs. After giving him medical treatment, they took him to a nearby village and placed him in a hotel room. While he was recuperating it was discovered that he was actually a saboteur, so they arrested him and loaded him on a bus bound for a concentration camp. Sometime during the transport Claus jumped out of the window of the moving vehicle and rebroke his arm, but this time he managed to escape for good. He was highly decorated for his valor. He died in his home in Rjukan, Norway in 2003. 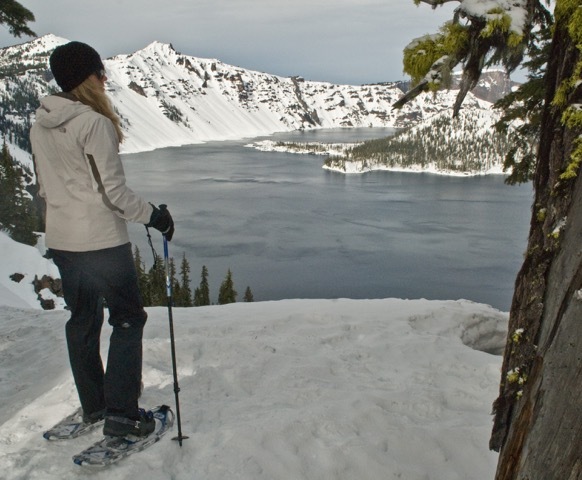 There’s no better way to see Crater Lake National Park in the winter and spring months (December through May) than by snowshoeing — the fastest growing winter sport in the world, according to the Snowshoe Institute of America. And on a weekend in mid-February, we experienced just that — an ultimate Crater Lake adventure. Many folks think of Crater Lake as a summer or fall destination, yet it might be time to change your mind. If you can walk and dress in layers, you can succeed at an awesome nature outing on a beautiful blue sky sunny day! The road to Crater Lake’s Rim Village is open year-round, as is the Steel Visitor Center. Plus, very friendly and helpful park rangers will welcome you every step of the way . “Amazing” was the correct description indeed. It’s all about the view at Crater Lake, and as we strapped on our snowshoes and stepped up to the edge, we were captured by a state of jaw-dropping, snow-covered beauty! The Medford Mail Tribune reported that Crater Lake National Park broke a 67-year-old record for December snowfall in 2015. According to the National Weather Service, 196.7 inches of snow fell at the park in December, breaking the previous record of 196 inches set in December, 1948, when Harry S. Truman was president and Alaska and Hawaii had not yet earned their statehoods. Early on in the day, we met up with an ambitious foursome of snowshoers who took their Presidents Day Weekend to hike the perimeter of Crater Lake and snow camp. Yes, I said camp in the snow! As I chatted with them, I discovered the women were life-long schoolmates and friends. They and their beaus decided to meet-in-the-middle of their respective Bay Area California and Seattle homes. With pre-prepared foods, cook stoves, safety directional devices, snow shovels, ice picks and warm sleeping bags, pads and tents, they were jubilant to be on their way. On the drive back home from Crater Lake to Ashland, our happy guests were holding hands — real sweethearts who had welcomed the adventure and the companionship. It was clear that they had enjoyed a truly amazing day! © Main Street Adventure Tours | Ashland, OR | All rights reserved. All photo images are the property of Main Street Adventure Tours and are protected.